That’s the perspective I’m writing from. If you’re a mobile engineer, my perspective might look odd. You will learn the basics of React Native anyway. If you’ve never used React before, awesome! I’ll explain. This article is about the basics. There’s enough to get your feet wet and see what React Native is all about. We’re going to cover the rest in future articles. You’ll get two articles per month. Just subscribe to get updates by email. Today’s app is not the best app in the world. No, it’s just a tribute. A taste of what React Native can do for you. I was going to lead with a Why React Native and a Why React section, but you know what, screw that. Let’s build stuff! 6 of the cutest pictures ever with AI-generated captions. We’re building a cute image clicker. Tap on the right to go forward, tap on the left to go back. Remember: I know it’s not the best app in the world; it’s a tribute. Now, I’m going to say things in this guide, and they might confuse you, especially if you’re new to React. Don’t worry, that’s normal! I’m confused all the time. Follow along, try things out. Play. You will have a small working app when we’re through. Then I’m going to explain everything in future articles. You can see the final code on Github here. Commits follow this article. You need Xcode for the iPhone simulator so that you can run apps locally on your machine. You’ll never have to open Xcode. Unless you want to, I guess. I hear its text editor is pretty good. Unfortunately, you can’t build iOS apps on Linux or Windows. Those are Apple’s rules  But you can build for Android! To work with Android, you’ll need Android Studio. Again, just for the simulator. Facebook’s official docs have a great guide for all 5 dev OS/app OS combinations. I shan’t repeat here. Once you have node.js and a simulator, you should install react-native-cli: The suite of tools that compiles and runs your app. PS: npm is the node.js package manager. We’ll use it to handle dependencies throughout this React Native School. The easiest way to start a new React Native project is with the react-native utility. The point is, you don’t need to know, and that’s great. The fewer details you have to worry about, the more time you have to build cool apps. We need two index.js files because most apps offer a different experience on Android and iOS. You can share code between them and you should, but you’ll want to put it together differently. The easiest way to do that is to use a different index file. There are two ways to run your app. You can open JustATributeApp/ios/JustATributeApp.xcodeproj in Xcode and hit the run button. But then you’re in Xcode, and you might get tempted to fiddle with things that don’t need fiddling. I know I would. When you do that, react-native does a couple of things for you. It runs the simulator, compiles your app, starts a dev server, and sets up hot loading. I don’t know the details, but I imagine it’s similar to how it works on the web. The result is a Hello World app. Much like on the web, Cmd+R restarts the app from scratch. That part is familiar. Cmd+D opens a dev menu. That part is new. We have many options. I suggest enabling either Live Reload or Hot Reloading while you work. Live reload restarts your app every time it sees you’ve changed a file so that you’re always running fresh code. It’s reliable and works every time. Hot reload achieves the same result, but it tries to swap components with their new versions without reloading. This is great for complex apps because you don’t have to keep navigating your interface, but it often leads to strange corner cases. Use with caution. Then again, using the Inspector gives you all the same options. Click a thing and see how its styled and what it does. It’s got more fun debugging tools like a network monitor, performance analyzers, and such. We’ll explore them while we build more serious stuff. Ok, you know how to start a project, run your app, and some debugging basics. Let’s fire up the editor and write some code. We’re building a small app, so all of our code goes into index.ios.js (or index.android.js if you’re building for Android). Let’s define the 6 cute images and add an import for Image (the component for rendering images) and an import for TouchableHighlight. We’ll use it to make the image clickable. label: "Cat on a blue blanket"
label: "A close up of a dog"
label: "Sheep next to a cat"
label: "Cat laying on the grass"
label: "Bird sitting on a railing"
You didn’t think we were going to build an image search client and AI image captioner in 46 lines of code, did you? Don’t be silly. That would take at least 47 lines. If you refresh the simulator, your app will look the same as before. Let’s fix that. We need to expand the default style definitions. It’s easier to explain if we do it before rendering components. Plus it looks magical when they immediately look perfect. No designers were involved in the making of these stylesheets. They use camelCase instead of dash-case. Is that what it’s called? background-color becomes backgroundColor, text-align is textAlign and so on. You get the idea. There’s no nesting unless you use extensions. We’ll explore those later. We changed container.backgroundColor because we could, removed welcome and instructions because we’ll get rid of them, and added image, imageLabel, and empty. 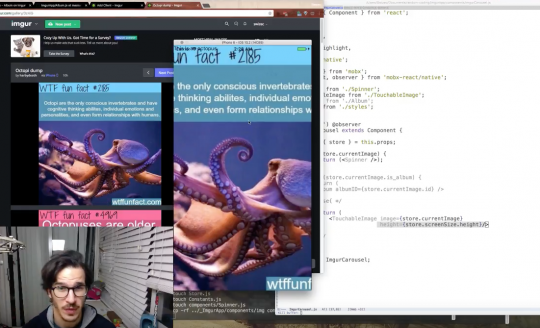 React Native uses flexbox to layout boxes on screen. We use flex: 1 and flex: 2 to specify how high a priority something should get. This will make more sense when we put images on screen. Generally speaking, you should never define fixed widths or heights in React Native. Let the layouting engine do that for you. Your job is to define proportions. I do like the new blue. Great. We have the styles and the image definitions. Let’s make that render method. That’s how React renders UI, by the way. You build components with one render method each. It defines what a component looks like, which child elements it uses and such. Okay, we kept the main <View> component. It’s analogous to a <div> in HTML. We use two <View>s with the empty style – flex 1 – and an <Image> with an image style – flex 2. This combination vertically centers our image and gives it a height of 50%. We had to fix width at 320px because React Native doesn’t understand 100% sizing. Inside the Image, we put a <Text> element that renders our caption. It gets a partially transparent grey background and centers white text. To get the image URL, we used a combination of this.state and the Images constant. State is a React thing that stores… state. You can think of it as a magic property that triggers re-renders when it’schanged. 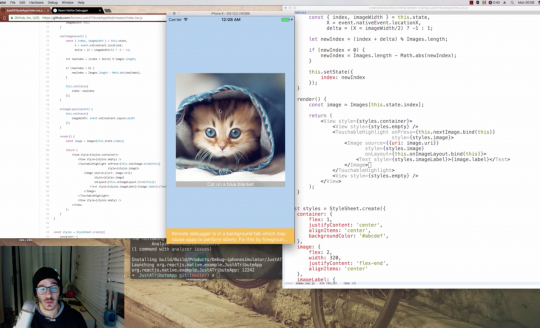 Our app now renders a kitten. Click on the right side of the image for next, left for previous. To do that, we wrap our image in a <TouchableHighlight> component and add some logic that manipulates this.state. But it’s okay. It’s not difficult code. We added imageWidth to state because React Native can’t detect how wide a component is on the fly. You need to hook into the layouting engine and save that info for later. This might be an antipattern. I wanted flexible logic so I can make the image 100% wide when I figure out how. Mobile devices change dimensions. Especially when you rotate them. Then we have nextImage. It’s an onPress callback that triggers when our user taps the cute kitten. When that happens, we calculate whether the press was left or right of center, calculate the new image index, and make sure it doesn’t reach for undefined images. We use this.setState to update the index in state. This triggers a component re-render, which sees the new index, and renders a new image. Nifty, isn’t it? The onImageLayout function helps us set state.imageWidth. It’s an onLayout callback event for the <Image> component. One thing to keep in mind with React Native is that you can’t attach click/touch events to random components. You have to use TouchableHighlight to wrap touchable areas. I imagine this can get unruly, but it makes sense. I like that TouchableHighlight takes care of giving UI touch feedback to the user as well. You now have an interactive cute image clicker. If it didn’t work, consult the Github project. Commits follow steps in this article. You now know the very basics of React Native: How to set up a project, how to run the app locally, and tools to use when debugging. And you’ve built your first app! That means you know roughly how React components work, how to style them, and some caveats that make mobile different than the web. Over the next 23 articles, we’re going to build a complex React Native app with many bells and whistles. You’ll be a pro mobile developer when we’re done. In this lecture you’re going to build your first mobile app. A clicker of the cutest photos on the internet in just 46 lines of code. Today, we’re building an Imgur app. A supreme fullscreen image browsing experience to make your  even more fun. A fullscreen view of Imgur’s frontpage. Tap on the right for next pic, left for the previous. Albums scroll up and down. It’s like Snapchat, but for the Imgur gallery.